Porsche Hawaii is excited to offer this 2018 Porsche Macan. Want more room? Want more style? This Porsche Macan is the vehicle for you. You deserve a vehicle designed for higher expectations. This Porsche Macan delivers with a luxurious, well-appointed interior and world-class engineering. Enjoy the comfort and safety of this AWD Porsche Macan equipped with many standard features found on other vehicles as optional equipment. You can finally stop searching... You've found the one you've been looking for. This outstanding example of a 2018 Porsche Macan is offered by Porsche Hawaii. This SUV gives you versatility, style and comfort all in one vehicle. Pull up in the vehicle and the valet will want to parked on the front row. This Porsche Macan is the vehicle others dream to own. Don't miss your chance to make it your new ride. This Porsche Macan is equipped with AWD for improved handling. Whether you're faced with inclement weather or just out enjoying the twisting back road, you'll have the grip of AWD on your side. Beautiful color combination with Jet Black Metallic exterior over Black/Luxor Beige interior making this the one to own! This outstanding example of a 2018 Porsche Macan is offered by Porsche Hawaii. Want more room? Want more style? This Porsche Macan is the vehicle for you. You appreciate the finer things in life, the vehicle you drive should not be the exception. Style, performance, sophistication is in a class of its own with this stunning Porsche Macan. No matter the weather conditions or terrain, this Night Blue Metallic AWD Porsche Macan handles with an elegant confidence. Fine interior appointments complement this vehicle's unprecedented performance. You've found the one you've been looking for. Your dream car. Contact Porsche Hawaii today for information on dozens of vehicles like this 2018 Porsche Macan . Want more room? Want more style? This Porsche Macan is the vehicle for you. Pull up in the vehicle and the valet will want to parked on the front row. This Porsche Macan is the vehicle others dream to own. Don't miss your chance to make it your new ride. Simply put, this all wheel drive vehicle is engineered with higher standards. Enjoy improved steering, superior acceleration, and increased stability and safety while driving this AWD PorscheMacan . The look is unmistakably Porsche, the smooth contours and cutting-edge technology of this Porsche Macan will definitely turn heads. This outstanding example of a 2018 Porsche Macan is offered by Porsche Hawaii. This SUV gives you versatility, style and comfort all in one vehicle. You deserve a vehicle designed for higher expectations. This Porsche Macan delivers with a luxurious, well-appointed interior and world-class engineering. This vehicle has an added performance bonus: AWD. It improves handling on those winding back roads, and gives you added safety and control when driving through wet and snow weather conditions. The 2018 Porsche exterior is finished in a breathtaking Black, while being complemented by such a gorgeous LTHR INT BLK/GAR RED interior. This color combination is stunning and absolutely beautiful! Contact Porsche Hawaii today for information on dozens of vehicles like this 2018 Porsche Macan . Want more room? Want more style? This Porsche Macan is the vehicle for you. You deserve a vehicle designed for higher expectations. This Porsche Macan delivers with a luxurious, well-appointed interior and world-class engineering. Navigate through all the icky weather with ease in this AWD-equipped Porsche Macan, and even get non-stop traction for your non-stop lifestyle! In addition to the amazing traction control, you may even qualify for an insurance reduction with this AWD vehicle. You've found the one you've been looking for. Your dream car. Contact Porsche Hawaii today for information on dozens of vehicles like this 2018 Porsche Macan . Want more room? Want more style? This Porsche Macan is the vehicle for you. There's a level of quality and refinement in this Porsche Macan that you won't find in your average vehicle. Comfort. Performance. Safety. Enjoy all three with this well-appointed AWD 2018 Porsche. This vehicle won't last long, take it home today. This 2018 Porsche Macan Sport Edition is offered to you for sale by Porsche Hawaii. Want more room? Want more style? This Porsche Macan is the vehicle for you. Pull up in the vehicle and the valet will want to parked on the front row. This Porsche Macan is the vehicle others dream to own. Don't miss your chance to make it your new ride. Simply put, this all wheel drive vehicle is engineered with higher standards. Enjoy improved steering, superior acceleration, and increased stability and safety while driving this AWD PorscheMacan Sport Edition. Just what you've been looking for. With quality in mind, this vehicle is the perfect addition to take home. This outstanding example of a 2018 Porsche Macan Sport Edition is offered by Porsche Hawaii. This SUV gives you versatility, style and comfort all in one vehicle. Pull up in the vehicle and the valet will want to parked on the front row. This Porsche Macan is the vehicle others dream to own. Don't miss your chance to make it your new ride. This AWD-equipped vehicle will handle beautifully on any terrain and in any weather condition your may find yourself in. The benefits of driving an all wheel drive vehicle, such as this Porsche Macan Sport Edition, include superior acceleration, improved steering, and increased traction and stability. There is no reason why you shouldn't buy this Porsche Macan Sport Edition. It is incomparable for the price and quality. Contact Porsche Hawaii today for information on dozens of vehicles like this 2018 Porsche Macan Sport Edition. Want more room? Want more style? This Porsche Macan is the vehicle for you. You appreciate the finer things in life, the vehicle you drive should not be the exception. Style, performance, sophistication is in a class of its own with this stunning Porsche Macan. When driving an all wheel drive vehicle, such as this Porsche Macan Sport Edition, superior acceleration, traction, and control come standard. You can finally stop searching... You've found the one you've been looking for. Contact Porsche Hawaii today for information on dozens of vehicles like this 2018 Porsche Macan Sport Edition. This SUV gives you versatility, style and comfort all in one vehicle. There's a level of quality and refinement in this Porsche Macan that you won't find in your average vehicle. You'll love the feel of AWD in this 2018 Porsche Macan. It provides a perfect balance of handling power and control in virtually every driving condition. The Porsche Macan Sport Edition will provide you with everything you have always wanted in a car -- Quality, Reliability, and Character. Contact Porsche Hawaii today for information on dozens of vehicles like this 2018 Porsche 718 Cayman . There's a level of quality and refinement in this Porsche 718 Cayman that you won't find in your average vehicle. You could keep looking, but why? You've found the perfect vehicle right here. You can finally stop searching... You've found the one you've been looking for. This is the one. Just what you've been looking for. Contact Porsche Hawaii today for information on dozens of vehicles like this 2019 Porsche Cayenne . Want more room? Want more style? This Porsche Cayenne is the vehicle for you. You deserve a vehicle designed for higher expectations. This Porsche Cayenne delivers with a luxurious, well-appointed interior and world-class engineering. No matter the weather conditions or terrain, this Moonlight Blue Metallic AWD Porsche Cayenne handles with an elegant confidence. Fine interior appointments complement this vehicle's unprecedented performance. This is about the time when you're saying it is too good to be true, and let us be the one's to tell you, it is absolutely true. 718 Cayman: The 718 Cayman is a sports coupe with two available engines and features that include a sport steering wheel, heated side mirrors, and ParkAssist. 718 Boxster: The 718 Boxster offers the same features as the Cayman, with the exception of its convertible body style. 911: Offered in a full range of trims, the 911 offers something for just about any Ewa Beach sports car fan. The base 911 Carrera kicks off the lineup with a twin-turbo engine, Porsche Active Suspension Management, and 19-inch wheels. Macan: The Macan is a mid-sized SUV with 53 cubic feet of cargo space, as well as three turbo engine options, Power Steering Plus, and available WiFi. Cayenne: Larger than the Macan, the Cayenne offers 62.9 cubic feet of cargo space, plus navigation, a cooled glovebox, and available air suspension. Panamera: The Panamera is a sedan-hatch, offering a lineup of powerful turbo engines, a 12-inch touchscreen display, and an optional 21-speaker sound system. Why Buy a New Porsche Vehicle from Us? Whether you’re interested in buying or leasing, our team is here to guide you through the process. 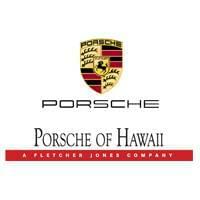 Porsche Hawaii is staffed with professionals who are passionate about the Porsche brand. If you have questions about how Porsche compares to competitors, or your Porsche warranty options, contact us online or by phone! Don’t forget to check if there are any special offers on the Porsche vehicle you want!